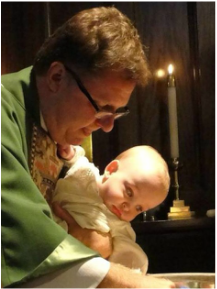 Baptisms are important events not only for the person being baptized but for the entire parish community. Every baptism, infant or adult, is an occasion for remembering and celebrating God's invitation to be in relationship with him. Baptisms usually take place on a Sunday during the Eucharist, but are especially appropriate at the Easter Vigil, on the Day of Pentecost (50 days after Easter Day), All Saints' Sunday (first Sunday in November), and on the Feast of the Baptism of Our Lord (the Sunday after January 6th). ​is special to the family. To schedule a baptism or for more information, call the church office at 304.529.6084. ​to living a Christian life. the gifts of the Holy Spirit. ​As more and more people joined the church, bishops allowed priests to baptize but reserved the laying on of hands - confirmation - for themselves. Many people are confirmed in the church when they are in their early teens and mature enough to make the commitment required of them. Others are confirmed as adults. It is usually parish priests who prepare candidates for confirmation. ​to the bishop for confirmation. We hope to begin instruction and preparation for a new group of confirmands soon. ​If you or a loved one is ready for this life-changing commitment, please contact the church office at 304.529.6084 for details.